Buy Web Hosting Review 2019: Is Buy Web Hosting a Good Hosting? Buy Web Hosting is committed to providing fast, affordable and reliable web hosting services with excellent technological innovations. Buy Web Hosting was founded in 2013 by web hosting professionals with outstanding backgrounds and experience. The company aims to make the web hosting experience as smooth as possible by embracing modern technologies. This vendor offers superb web hosting services in English. Buy Web Hosting’s website builder makes it easy to create a website to be hosted on one of the myriad domain options (including .org, .com, .info, and .co.uk) that can be comfortably hosted within the same cPanel account. A variety of Linux-based VPS options include RAM of between 512 MB and 8 GB plus guaranteed bandwidth. Unlimited sites can be hosted within the same cPanel. Buy Web Hosting’s plans can be purchased at very accommodating prices on weekly, monthly, and annual billing cycles using convenient payment methods including bank transfer. 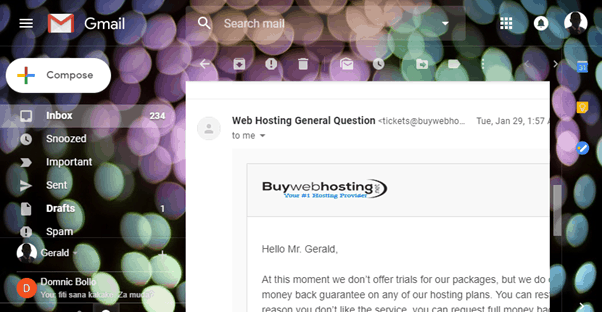 The best bit is Buy Web Hosting’s amazing 45-day money-back guarantee, which gives you plenty of time to get out if it all goes wrong. You can contact this company for 24/7 support via an email ticketing system or telephone. When I tested their support ticket system, I found it to be surprisingly slower than I expected, and I agree with many customers who say (in online reviews) that they need to improve their response times. Customer comments do praise this vendor’s willingness to listen and resolve problems, which is fortunate because their self-help knowledge base is somewhat lacking. Buy Web Hosting offers high-quality services with a variety of features at affordable prices. Customer service is a little slow but is user-friendly and reliable. Wondering how Buy Web Hosting stacks up against other Web Hosting companies? Enter any other Web Hosting company and we will give you a side-by-side comparison.